International Journal of Research in Health Sciences,2015,3,2,230-234. 1-Assistant professor, Department of Community Medicine, Shri Ram Murti Smarak Institute of Medical Sciences, Bareilly (UP), INDIA. 2-Professor, Department of Community Medicine, Himalayan Institute of Medical Sciences, SRHU University, Dehradun, Uttarakhand, INDIA. 3-Associate professor, Department of Community Medicine, Himalayan Institute of Medical Sciences, SRHU University, Dehradun, Uttarakhand, INDIA. 4-Professor and Principal, Department of Community Medicine, SRMS IMS, Bareilly (UP), INDIA. Background: Use of smokeless tobacco is common in South Asia. Tobacco is a major preventable cause of morbidity and mortality. Aims and Objectives: The aim and objective of the study was to find out the prevalence and pattern of smokeless tobacco use in rural population of Dehradun. Materials and Methods: This cross sectional study was conducted in the rural field practice area of Department of Community Medicine, Himalayan Institute of Medical Sciences, Dehradun. The households were selected by systematic random sampling and all the smokeless tobacco users in the surveyed house were personally interviewed using a pre-structured and pretested schedule. Results: Overall 434 current smokeless tobacco users (Males-16.9%, Female-8.1%) were interviewed. 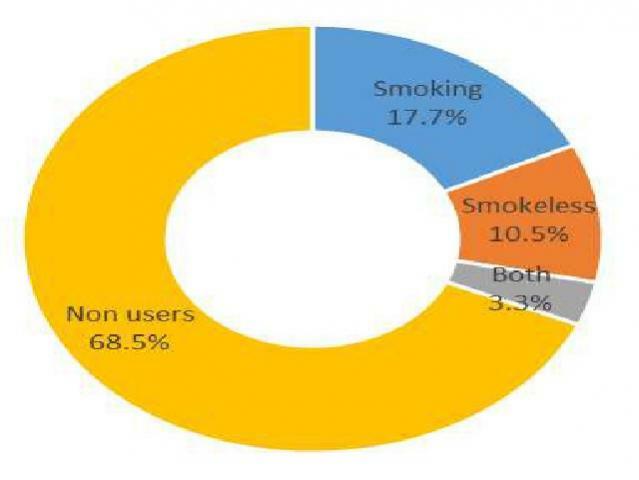 Prevalence of smokeless tobacco increased with advancing age and the difference was statistically significant (2=22.34; p<0.0003).Peer Pressure (32.9%) was the major reason for the initiation of smokeless tobacco followed by enjoyment (18.9%) in the surveyed population. Conclusion: The high prevalence of smokeless tobacco use found in the study warrants the implementation of focused strategies and policies mainly aimed at removing the myths associated with smokeless tobacco use in the rural settings.